I am sharing one of an order of four sympathy cards I had to make recently. I promise that I won't show them all at once. This one started with a kraft base, and a layer of paper from the KaiserCraft Vintage Timeless pad. The sentiment was stamped using Espresso Ink, and an ODBD stamp from the With Deepest Sympathy set onto a die cut label threaded through some gold spotted ribbon. The butterfly is cut with the Pippi die by Memory Box, from a snippet of dull gold card. And this verse from the ODBD With Heartfelt Sympathy set on the other side, again using the espresso ink. All the edges of the card and paper were sponged with Delicata Golden Glitz Ink before assembling the card, and a few gold rhinestones added to finish. This is a card that came together really quickly - I was fossicking through my die cut scraps and I came across the negative part of a (Frantic Stamper) small hand tools die I had cut. I had seen a similar negative die cut used elsewhere (no idea where or how, now, sorry) so ran with that as a basis for this card. The embossed panel was another snippet that was on my desk, a trimming from a previous endeavor. After embossing it I sponged it lightly with espresso ink. All edges were sponged with the same ink, and the sentiment (by Kiwistamping) stamped using it. The final detail was a piece of washi tape on the bottom of the insert. I had not meant to be absent from blogland for quite so long, but my computer, camera card and external hard drive were not talking to each other - they got over their hissy fit this evening, and now I can show you what I have been working on. I have had this layout on my mind for several days, and this afternoon it was just a case of sorting out which materials I would use to create it. The thread is some glitter machine embroidery thread. I put three coats of WoS over the die cut to get the sparkle. I deliberately tore the ends of the washi tape, and layered a narrow lace under the edge of the lower piece. The sentiment is an old one from Kiwistamping, which was embossed in blue. The final detail were some flat, blue holographic sequins. I finished the inside of the card with more washi tape. This will be a short post as 1) this card is very CAS and 2) I have had to use a phone photo as my camera and computer are not being cooperative, so the detail photos I took are nowhere to be found! being the Feline Good stamp and die set by The Project Bin. 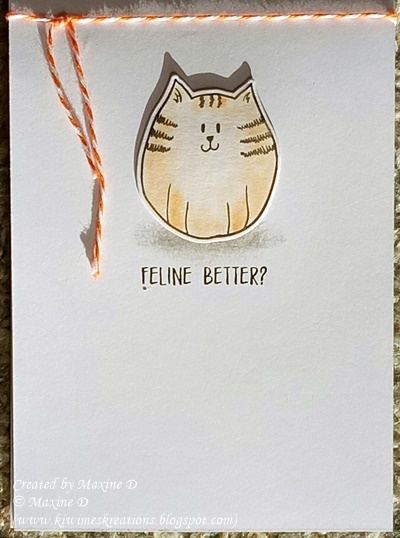 I stamped and cut the fat cat of the set on a snippet of card, and coloured him with chalks. Next I stamped the sentiment, and added some grey chalk to ground the cat. To add some subtle dimension I added two layers of card under the cat before positioning him. The orange twine, which tied the pretty packaging the set came in, was tied across the top to finish. Please pop over and have a peep at her beautiful work, and say hello. These were the thank you/memorial cards that I sent to acknowledge the love poured out to me after my husbands death. I received many cards and well wishes from so many people, that I was like a one armed paper hanger in tornado making these - well, a slight exaggeration, as I developed a 'system' that worked for me and was quite methodical!! - even if I did take over part of the kitchen bench for several days, but as there is 'just me' now, it was not an issue. I made a selection of designs in this batch, but all the same layout. These were all stamped using the Misti - what a gem of a tool!! The images were all from a NBUS Your Next Stamp set called Framed Flowers. and the Thanks was a stamp from the Duck set by Kiwistamping. I made nearly 70 of these cards - it was quite a marathon, but by working systematically I got through them in relatively short time. I am sharing them now as I know the majority have now arrived at their destinations - all around the globe!! I don't often make cards with many layers, but this was the exception to that 'norm', and I was very happy with the results. The scripture was stamped onto a journaling card (by Prima) in Espresso ink, and the panel had the ribbon and clear rhinestones added before I layered it over the scrap of pink the same as the base, and a scrap of embossed card that I had tried to colour and it hadn't really worked... the smudges don't show with it being layered like this! I used a neutral coloured paper on the base, and wanted the colour of the sentiment to blend in, and tone with the ribbon - it did that a bit better than I thought it would, but as it does not detract from the overall look of the card, I let it be, and did not try to redo it before assembling the layers. A few sequins and the card was finished. I have recently seen some wonderful cards made using nail polish marbling, so I bought some cheap ones and had a play... after watching some videos here and here. I took the advice offered and ended up working outside whilst I was playing, and I was very glad I did as the fumes are potent! These are the results, and I discovered that some colours were better than others, and that I suspect was a variation of quality, as they were very cheap!! 3 for $5. I chose this green one for the feature panel of a card I made yesterday. I trimmed the marbled paper, and layered it over a bright green backing, then a forest green base, when I realised I had no layer to hide the ends of the ribbon behind - oops. and one end of the layered ribbons. I was really happy with the end result of this card, which is now in the mail.